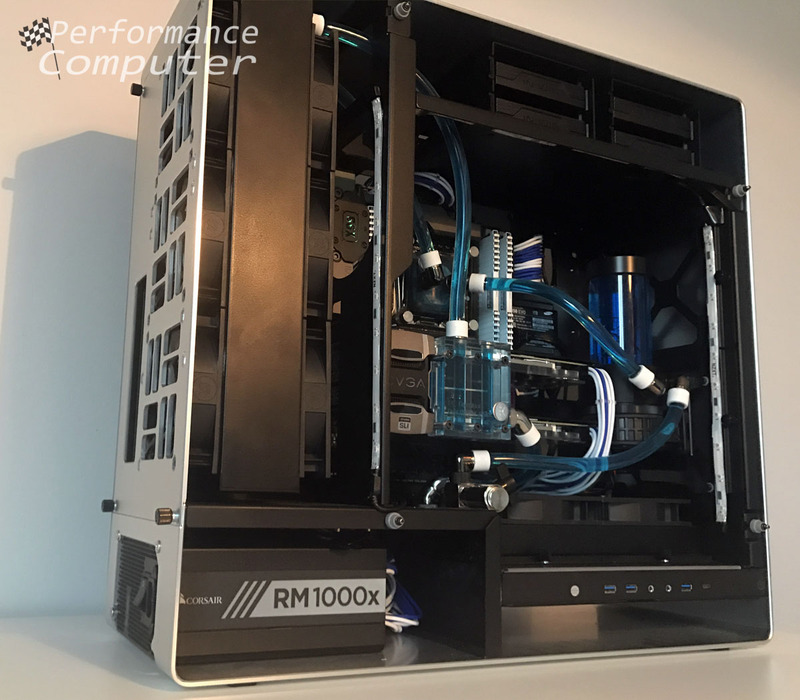 We went all out to review the In Win 909 gaming chassis and created a monster custom liquid cooled gaming and productivity machine so we could provide the best review possible! 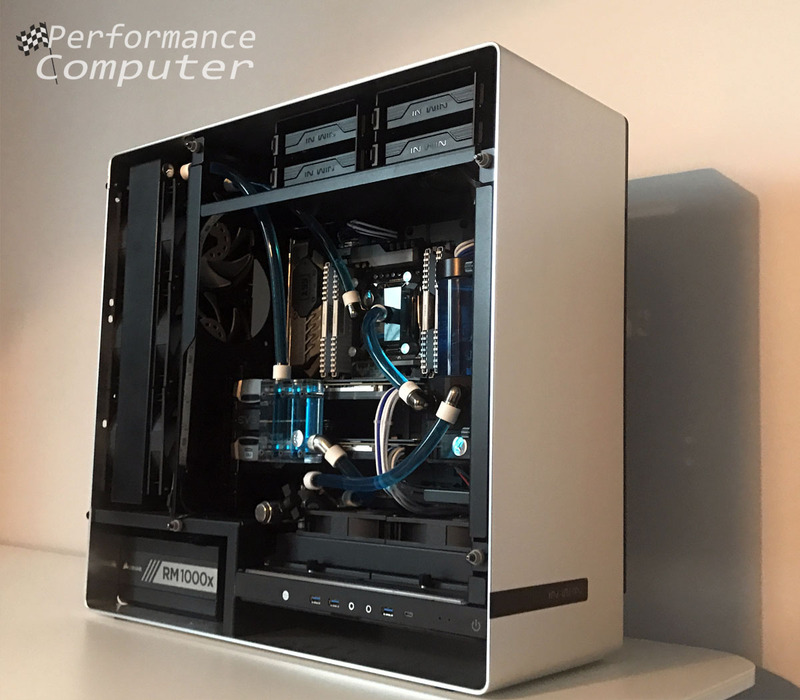 The result is one of the most powerful machines I’ve ever had the pleasure of building. I’ve built computers in many rare and high-end cases such as the HP Blackbird 002 and VooDoo Omen, read on to find out why the 909 is just as special. 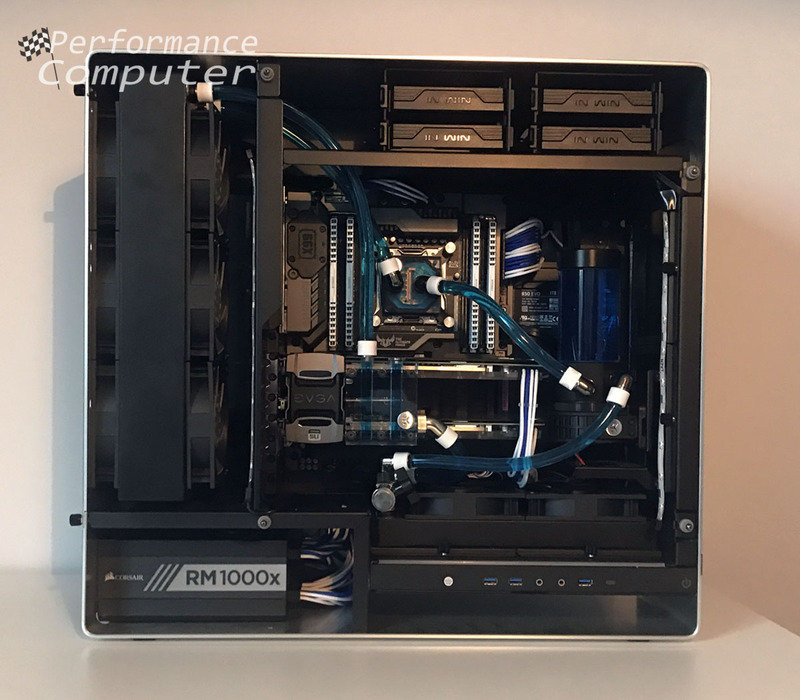 The first thing I noticed about the In Win 909 was its top-tier build quality, striking looks and the capability to comfortably house a complex water cooling loop. The 909 is available in a beautiful silver or black aluminum, we went with the silver version as it reminded me of the last VooDoo Omen that was created in 2008. Upon unboxing the In Win 909, we were very impressed with its size, weight and sheer beauty. 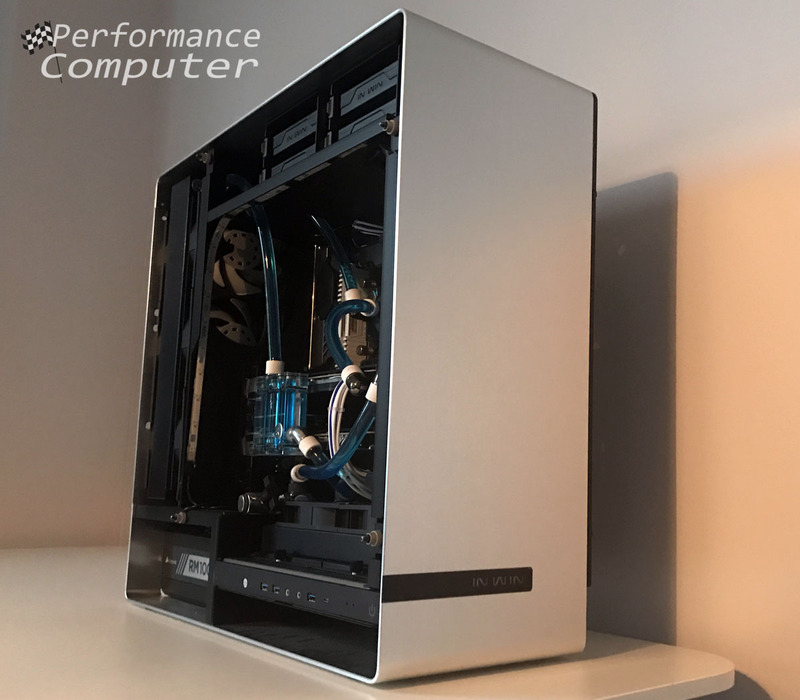 The silver brushed aluminum and the thick tempered glass side panels are a beautiful combination. 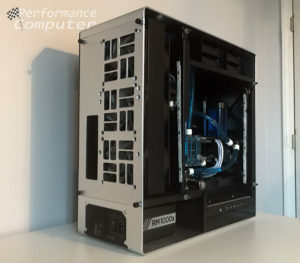 There are four chambers: in the back there’s room for a radiator and fans, the power supply is housed on the bottom, up top there are four 3.5” hard drive bays and finally the main chamber is where most of your components will be installed. At $400, the 909 is not cheap, however if you want a case that will last a lifetime and oozes quality, it certainly fits the bill. 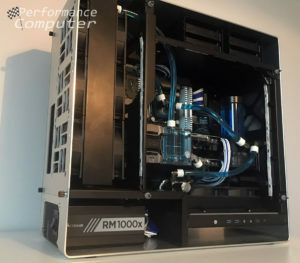 In Win could have omitted the four 3.5” hard drive bays up top as that space could have been much better utilized for additional water cooling components. A fan filter for the rear chamber would be a welcome addition as well. Other than that, it’s quite the case! 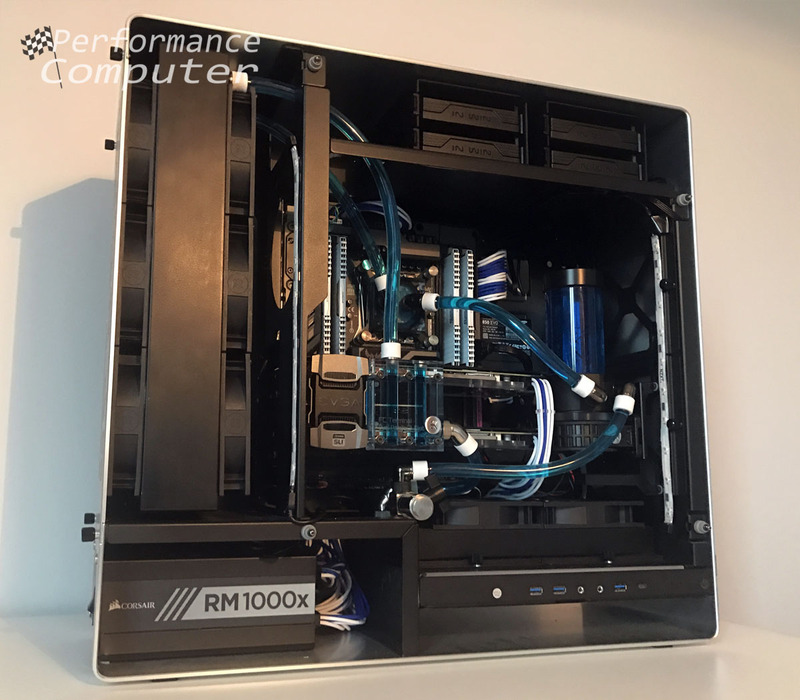 This build log is for a high-performance computer that will be used for high FPS gaming as well as scientific research. We chose the overclockable 6-core Intel Core i7-6850K processor as the heart of the machine and paired it with an Asus Sabertooth X99 ATX motherboard. Both are high-quality components and will be in service for many years. The Asus Sabertooth X99 is built very well, comes with a ton of accessories and most importantly, there were no issues out of the box with the stock BIOS. Speed was of primary concern so SSD’s were chosen for all storage including a 500GB Samsung 960 EVO M.2 PCI-express SSD as the boot drive and a 1TB Samsung 850 EVO SSD for additional storage. The M.2 drive is blazing fast. I highly recommend M.2 drives whether they are traditional SATA or PCI-express, they are incredibly simple to install and make for a much cleaner build as they do not use cables. 32GB of DDR4-3200MHz Corsair Vengeance RAM was used, again no issues with the RAM. I’ve always had a good experience with Corsair RAM, we used the XMP profile to easily overclock it to 3200MHz. Finally, we filled out the case with two Nvidia GTX 1080’s running in SLI and a Creative Labs Z PCI-express sound card. Everything is powered by a Corsair RMx 1000W 80+ Gold fully modular power supply with custom sleeved white/blue CableMod ModMesh cables. 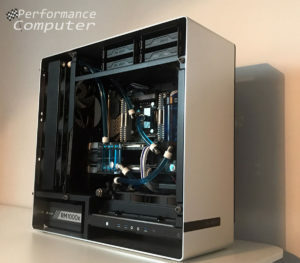 EK liquid cooling components were used, a full list is included below. We installed two radiators, a 360mm in the back of the case and a 240mm in the bottom of the main chamber for maximum cooling and overclocking potential. The 360mm radiator is 60mm thick and has six fans installed in a push-pull configuration, while the 28mm thick 240mm radiator has two fans installed. The removable bracket on the rear of the case made mounting the rear radiator a very simple procedure, once we screwed it into the bracket all we had to do was click the bracket into place. 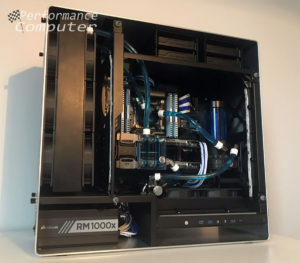 Soft tubing was used for its superior anti-leak properties and white compression fittings secured the tubing to each component. A terminal was used to connect the GTX 1080’s, it looks better than simple tubing, however it does add another step to the build process. The EK compression fittings seem to have been well made, we also used several 45° and 90° angled adapters, an X-splitter and an extender for the drain valve. Again, no leaks. The drain valve can be seen above the 240mm radiator and while it does empty some liquid, it was not nearly as useful as we hoped it would be. 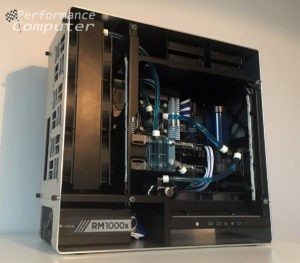 Perhaps if it were installed underneath the case somehow it could empty all the liquid aside from the 360mm radiator. A pump-reservoir combo unit was installed in the front of the case, leaving just enough room for the GTX 1080’s. It was a very tight fit! The D5 pump is very quiet and has a wide range of flow settings which can be configured with fan curves in the BIOS. An overclock of 4.2 GHz was achieved on the Intel 6850K with an idle temperature of 29° and a load temperature of 39°. We were able to overclock both 1080’s to an effective core clock of 2025 MHz from the stock clock setting of 1677 MHz, with idle temperatures of 31° and load temperatures of 42°. 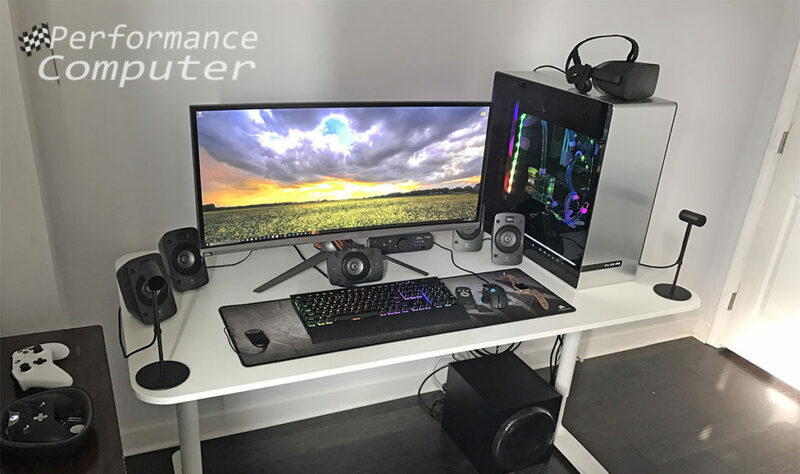 This machine runs every game at or near 100 FPS on the 34” Asus ROG Swift PG348Q gaming monitor and barely breaks a sweat while doing so. It’s also a dream for research work as the processor, SSD’s and memory help maintain a fast and efficient workflow. Overall this was a very enjoyable build and In Win nailed the 909. If you can afford it, buy it while you can as with most In Win cases, a limited number will be made. 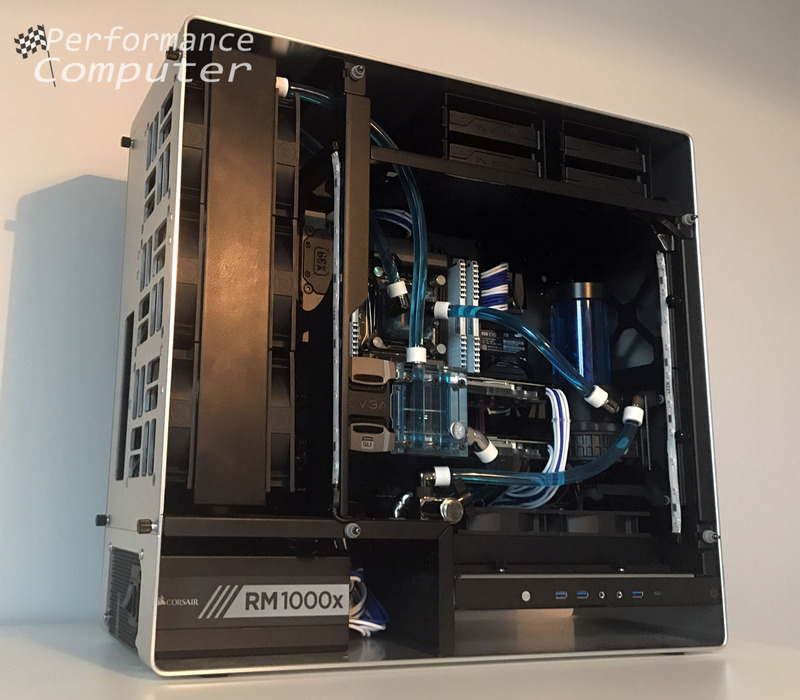 Filling out this high-end pc chassis with top-tier components and an over the top custom liquid cooling system is something every PC enthusiast should be able to do at least once! I recommend all the parts used in this build, we didn’t have an issue with a single component and couldn’t be happier with the temperatures and clock speeds achieved.